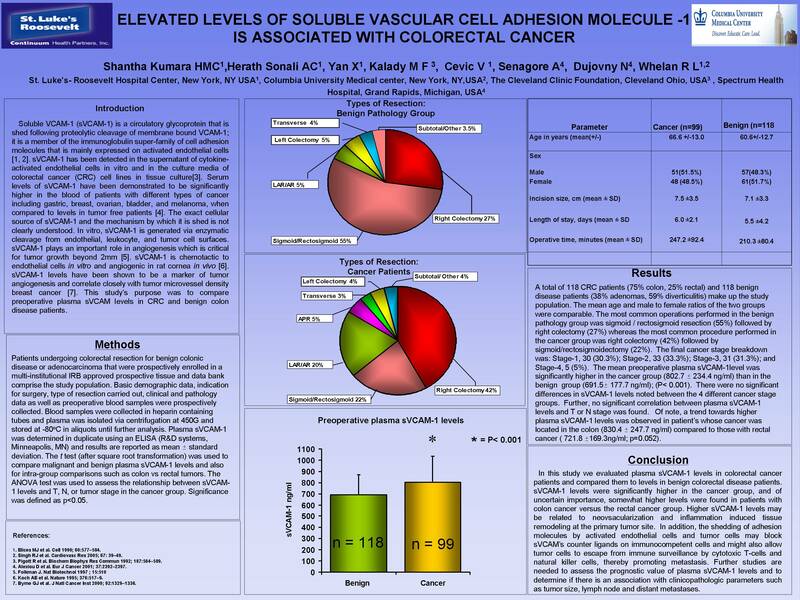 Introduction: Soluble Vascular Adhesion Molecule-1 (sVCAM-1) is a circulatory glycoprotein shed from transmembrane cell bound VCAM-1 which is expressed in vascular endothelial cells (EC). Inflammatory cytokines induce expression of VCAM-1. The ligands, alpha-4 integrins, are found mainly on leucocytes; binding facilitates leukocyte extravasation of into inflamed tissues. sVCAM-1 promotes angiogenesis in wounds and tumors by mediating EC chemotaxis and migration. Blood levels of sVCAM have been reported to be elevated in gastric, breast, and ovarian cancer patients and, in some cases, have prognostic value. Plasma sVCAM levels have note been studied in colorectal cancer(CRC) patients. This study’s purpose was to compare preoperative plasma sVCAM levels in CRC and benign colon disease patients. Methods: Clinical, operative, pathologic and demographic data was collected. Preoperative blood samples were obtained from 100 CRC and 118 benign disease patients undergoing colorectal resection(CR). sVCAM-1 plasma levels were determined in duplicate via ELISA and are reported as mean +/- SD. The t-test was used to compare sVCAM-1 levels between groups and the ANOVA test was used to observe any relationship between blood levels and Tumor(T), Nodal(N), or final tumor stage. Significance was defined as p<0.05. Results: Benign indications for CR were adenoma (38%), diverticulitis (59%) and other (3%). In the cancer group 74% of patients had colon while 26% had rectal cancers. In the benign group, the disease location was: sigmoid (55%), right ( 27%), left and other (18%). The cancer locations were: right (41%),left ( 30%), sigmoid (22%) and other (7%). The mean preoperative plasma sVCAM-1 level was significantly higher in the cancer group (800.6 ± 234.1 ng/ml) than the benign colorectal disease group (691.5±177.7 ng /ml)(p<0.001). Plasma sVCAM-1 levels in the colon subgroup was significantly higher (830.0± 247.7 ng/ml) than in rectal group levels (717.0 ±167.7 ng/ml)(p=0.038). No correlation was found between sVECAM-1 levels and T, N or tumor stage. Conclusion: The mean plasma sVCAM-1 level was significantly higher in colorectal cancer patients than in patients with benign colon diseases. Of note, colon cancer patients had significantly higher plasma levels vs the rectal cancer group. No differences in sVCAM levels were noted between the different tumor stages. Higher sVCAM-1 levels may be related to neovscularization and inflammation induced tissue remodeling at tumor sites. Additional studies are needed to determine if cancer resection results in a drop in sVCAM levels and also to determine sVCAM levels in a disease free patient group which would be a better control group.